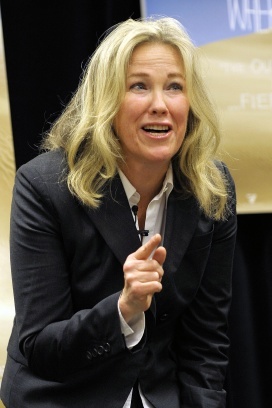 Catherine O’Hara was part of the comedy group Second City in Toronto in the early 1970s, but now she’s better known as the mom in Home Alone (1990) and as a familiar cast member of Christopher Guest’s “mockumentaries.” O’Hara was one of the original founders (along with John Candy and others) of the satirical TV show SCTV in 1976. In the 1980s she went into the movies and appeared in a variety of Hollywood comedies. Her notable roles include: the neurotic wife in Tim Burton‘s Beetlejuice (1987); the mother in Home Alone and its sequel (1990 and 1992); the voices of Shock and Sally in Tim Burton’s A Nightmare Before Christmas (1993); and the kooky ladies in Waiting for Guffman (1996), Best in Show (2000), A Mighty Wind (2003) and For Your Consideration (2006) . Her other films include The Paper (1994), Penelope (2006) and Where the Wild Things Are (2009). She frequently appears in movies paired with fellow SCTV alumnus Eugene Levy.